Our annual guys’ and girls’ retreats will be held at Aldersgate Camp May 3-5! 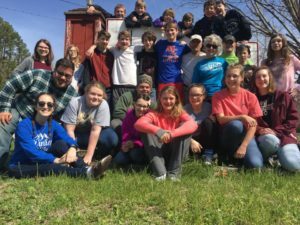 The trips will occur at the same time, but girls will be staying in a cottage and guys will be staying in the Outpost cabins, and the groups will be separate for most of the weekend. We’ll leave Friday afternoon, May 3, and return before lunch Sunday, May 5. The cost for the trip is $70, but scholarship money is available — just ask! Two nights of lodging as well as five meals (Friday dinner through Sunday breakfast) are included in that. You can pay via cash or check, OR you can pay through our giving website here — just select “Youth Guys’/Girls’ Retreat” as the fund you’re giving to. , and he’ll put you on the list. Money and forms will be due Wednesday, May 1. See links below for Emerge Student Form and permission slip. The trip is open to current sixth- through 12th-graders.